Today’s covers Ittoki Otoya’s route. 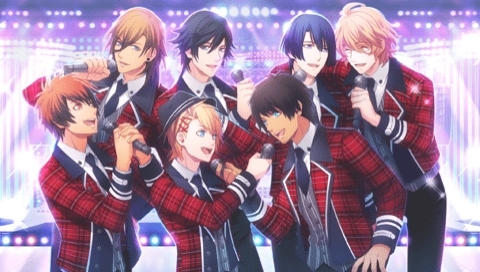 Starish each has one route with two endings. Note that the routes seem to take place after Debut and not after Rainbow Route in All Star. Both Rainbow Route endings are considered True Love endings, but A is the one you get when your love or music meter is below 80%. Haruka finishes work for the day at the agency. She’s 18 and has been working on various BGM. But today she’s going to also going to give a new composition to her boyfriend and partner. She has to hurry home but hears voices. She opens the door, and Syo is yelling at Natsuki. He says it was unfair to face Natsuki in a bread eating contest. Natsuki doesn’t understand why. Otoya is trying to calm Syo down. Masato points out that it didn’t matter about the bread if Syo can’t answer the quiz questions. Otoya says he had to go back to start five times because it was so difficult. Tokiya says it’s because Otoya took off before hearing the whole question. Ren remarks Tokiya skipped the bread race because it seemed too difficult. Cecil claims it’s because Tokiya hates high calorie bread, but Tokiya denies it. Haruka thinks back on how she debuted because of Starish’s support. (The group isn’t called Starish here, but I’m going to.) Otoya and Syo notice Haruka and invite her inside. Natsuki says they all were at the same location today. The others mention they have been working together a lot. In fact, Ren explains, they were on a sports variety show, divided into three teams. Team 1 was Masato and Natsuki. Team 2 was Tokiya, Syo, and Cecil. Team 3 was Ren and Otoya. Ren asks Haruka which team she thinks won. Haruka says Ren and Otoya. Otoya excitedly commends Ren for fixing Otoya’s mistakes. Ren was really good in both the bread-eating and quiz portions. Ren points out that Otoya race fast during the race and never gave up despite having to eat a lot of bread. Haruka thinks they might actually be a good pair. Otoya thanks Ren for the compliment. Haruka is happy they’re getting so popular. She thinks about how different it is from when she was alone and couldn’t debut. Starish points out that it’s thanks to her and her songs. They decide to head home, and Syo assures Haruka he’ll defeat any bad guys that people. Cecil asks Haruka to keep making wonderful music. Haruka is at the cafe, and Tomo rushes in, apologizing. They haven’t seen each other in a while because of their work. They split some cake and chat. Tomo asks how Haruka and her boyfriend are doing. Haruka starts panicking. Tomo asks if she’s bashful, and Haruka says it’s a little embarrassing. Tomo laughs and wishes for her excitement. She passes it off as a joke, saying it’s impossible for an idol. Haruka thinks about how her love life is a secret, but Tomo tells her she knows Haruka and her boyfriend are serious. Tomo then pulls out a magazine from Starish’s event yesterday and gives it to Haruka. She knows Haruka will want to read the interviews. They part, promising to keep in contact and go out again. She then goes to read her boyfriend’s interview. Haruka is looking for her seat at a concert. Otoya is performance at a music event. There’s a lot of artists and genres. Otoya gave her a ticket. She finally finds her seat. 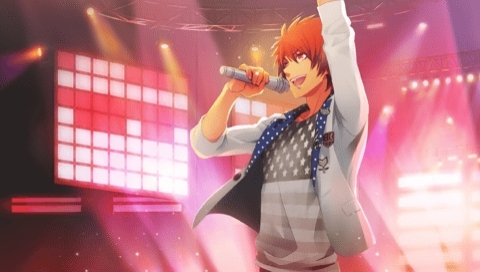 The lights go dark, and after a couple of bangs, Otoya greets the audience. Lots of people have been waiting for him. He sings his debut song. Haruka can sense how much fun he’s having. The crowd is getting pumped up as well. He’s even more in tune with the audience than usual. The next song features a guitar solo. The song warms Haruka’s heart as she thinks about all their memories. Next is his last song, much to the crowd’s disappointment. He would like to sing more, but other artists are waiting to perform. He does a quick turn and stops. Thanking the audience, he leaves. Other girls think he was gesturing toward them. Haruka then thinks there’s no way he spotted her among the audience. He says, “I love you!” and blows a kiss. Haruka gets flustered again as another girl thinks he was looking at her. He is amazing, Haruka thinks. He leaves the stage. After the event is over, she goes backstage to find him. She knocks on his dressing room door and she is invited inside. She screams. Otoya wonders what’s wrong. Haruka stutters. He says sorry, but he was sweating, so he took off his clothes. If she tries to hand him his shirt, she trips and crashes into his arms. He remarks how bold she is. If she closes her eyes, he says he’s okay now, but when she opens them again, he’s still half-naked. He laughs and hugs her. But she goes to leave the room. He shouts after her to not leave and he’s sorry. Otoya didn’t think she’d be so startled. He hugs her and asks if she’s angry. No, just embarrassed. He’s happy. He says he loves her. Being like this calms him down. It’s the opposite for Haruka. He doesn’t think she should be bothered so much; they’re lovers after all. That’s a separate matter. Haruka thinks to herself when they met he was a boy, but he’s a man now. He puts on a shirt. Now Haruka can talk and praises him on the show. Otoya sighs he still has a way to go. He watched the other performers and wants to do even better. She’ll work hard with him. With her support, he can do it. Did she notice his signal to her earlier? She’s surprised; then that really was…? Otoya blushes and wonders if his feelings didn’t reach her. It was dark, but that was awesome! Isn’t he a genius? Haruka agrees, and he chuckles and admits he just memorized her seat number and checked out her seat during rehearsal. But even if he didn’t, he would have found her because he loves her so much. And truthfully, he wanted to jump down and get closer to her. Haruka says it would have been bad. That’s why he restrained himself, although his past self might have done it. He’s really matured. She waits for Otoya outside. He runs up to her in glasses. He had a great time at the live. He wants to have a solo live in such a theater — no, an even larger location! She’d like that, too. He has to “power up” and study different genres to make people happy as an idol. He suggests the next song show his power up. Haruka replies it will be hard to create such a song, but he knows she can do it. Plus they can overcome anything together. He’ll give her the new song as a present so she’ll fall in love all over again. She already does keep falling in love, like watching him earlier on stage. He blushes. Texting him, meeting him is all like a dream. Well, he’ll just have to keep it up. He gets really excited and wonders where they can work — oh, wait, she’s probably tired. And it’s late. She’s wants to work. They take off running. They go to her apartment. He’s okay with any song she writes, but he’d like something cooler and more stylish. And power. She closes her eyes and concentrates. She’s done. It’s now morning. She doesn’t know if it’s what he wanted, but he’s ready to listen. After she plays, Otoya is excited. She starts analyzing it, and he thinks the look of a pro on her face is really cool. He watches her closely. Haruka plays again, and Otoya loves the cool intro. This will become an unrivaled song. She created this based on his vague image. Her music always surprises him. She’s so cute, so where does her power come from? It’s not power, it’s just what she feels when she sees Otoya. It’s their song. He’s so excited that he picks her up. Isn’t she heavy? Not at all! Happy, he spins around and won’t put Haruka down. He wants to keep her and her music all to himself. In his arms, she can’t be stolen away. She replies she’s Otoya-kun’s. It’s because she’s so cute when she says things like that that causes him to worry! Haruka suggests they go back to working on the song. He wants to stay like this. He puts her down but keeps holding her. Otoya wants to keep putting her in a dream-like state today. OK, but just for today. She hugs him. He wants to kiss. She closes her eyes and he places one on her lips. They spend the rest of the day together. Haruka really feels like she was in a dream. Her days with Otoya make her hear beat fast. Haruka watches as the staff gets ready. Otoya is appearing on Song Station today. It’s not for the new song since it is still in progress. 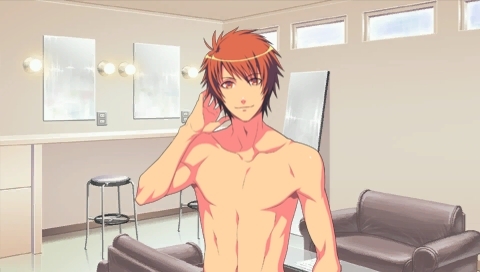 Otoya says hello to her as he prepares to go onstage. Tokiya then appears. They’re both on today. Haruka is surprised. Even Otoya remarks it’s amazing both are appearing on here. It’s almost time to begin. Tokiya sings his debut song. Otoya immediately gasps, and Haruka notes how Tokiya’s performance is better than before. Otoya is amazed and a little shocked. His eyes narrow in seriousness. A staff member says to get ready. Otoya snaps out of it and leaves. She wonders what she saw before was just her imagination. He gets a pro’s expression. He’s smiling, but Haruka senses something’s different. He won’t be singing freely like usual? She worries. He crashes into a part of the stage and falls down. The staff worries he’s injured, but he insists he’s fine. Both Otoya and the producer apologize. Otoya goes off to the side by Haruka. She asks if he’s okay. He’s alright. He’s anxious but also still not himself. He weakly laughs about his mistake. A voice remarks it’s rare Otoya’s so down. It’s Tokiya. Otoya sharply mutters he’s not sad. Tokiya then asks why is he so quiet. Otoya blurts out he’s image training. Tokiya, in a tone that’s indicates he’s not believing him, replies it’s the first time he’s heard of. The set change is ready. Otoya tells Haruka he’s going to do his best so watch. He leaves. Tokiya laughs (politely) and notes Otoya is so easy to understand. Tokiya remarks he’s finally got a rival. Tokiya’s been aware of Otoya since their school days. He goes on how he’s the perfectionist type. Otoya, on the other hand, moves with his body before he thinks. Haruka agrees it would be easy to be envious. But Otoya surely views him as a good rival. She knows how he worries about him. He replies his growth has nothing to do with him, but Haruka giggles. Otoya finishes recording. He comes out saying he could have done better. She tries to give him advice about how he wasn’t having fun. He’s happy she’s doing that instead of praising him. Tokiya agrees and asks if Otoya has something on his mind. Tokiya reminds Otoya he’s a pro now and should do his own performance. Tokiya walks away but the other calls out after him. Otoya wants Tokiya to listen to the new song. He’ll be glad to, just give him a call. Tokiya leaves. Home at night, Haruka works on the song. She wants to match Tokiya’s effort, but it’s not going well. She wants to show his growth, but it’s just not coming out in the song. Cool and stylish… She keeps working hard but wonders what to do. She can make a song for the usual Otoya, but… She’s a pro, too, so she should contact him when needed. Otoya asks her to come over to the agency. He’s just finished his work. She’ll go. She goes to the lesson room. She hears today’s piece from Song Station. She sees Otoya dancing. He’s seriously practicing and doesn’t notice her until she knocks. Haruka is going to sit, and he joins her. He’s been thinking about what Tokiya said but still doesn’t get it. His body and mind aren’t in sync. Haruka notices he’s still concerned about what happened. She tries to cheer him up, but he has no excuse. And Tokiya did fine on that same stage. He won’t fail next time. He’s been thinking a lot lately about what other performers can do. He feels frustrated and wants to match them. Haruka understands, and it’s good, but trying to find a new self may leave a part of himself behind. Otoya’s never thought far ahead, but he thinks his world will expand with a new side of him. He also wants to take on new challenges. It may be hard, but he wants to find a new self. He won’t overdo it. Her song has the answer. Haruka says not to make her worry. He apologizes. It’s okay because she’ll see new Otoya-kuns. He wants to hear the song. She pulls out her laptop and opens the song file. He’s amazed; it’s even better than before! She’s glad. They work on it a little longer. The song is making progress. She thanks him for his advice. He remarks she’s almost like his rival, propelling him to higher levels. It may be scary to move forward, but they can with a little courage. Haruka accepts the challenge. Otoya is excited since that was a rival-like thing to say. She won’t lose. His cute rival-san must live up to her words. He remarks working together makes them more like allies. It’s like a performance: he has to be aware of both the music and audience. He wants to become better. She’s always on his side, so he thanks her. Haruka is his number one ally. Otoya’s words make her happy. Otoya’s alarm goes off. They have to go, but he’s hungry. She offers to make him something. Excited, he requests curry. At Haruka’s place, she’s making curry and fixing a salad. Otoya is impatient, but it’s almost done. He helps out by setting the table. He hums happily. The food is served. It’s delicious. Otoya suddenly goes quiet and stares. Haruka is confused. “Somehow this also looks good.” Chomp! He eats from her spoon. She’s lost because it’s the same curry as his. He says it looked delicious. He can’t decide which one to eat, so he requests another bite from her plate. 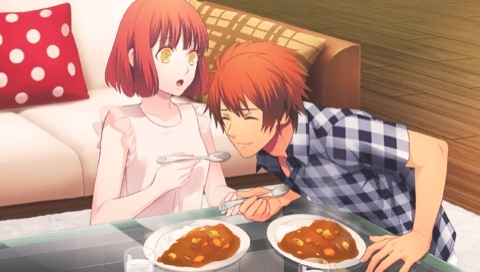 When he’s full, Otoya compliments the chef by saying her curry is the best. They sit on the sofa. He wants to stay like this a little longer. Of course, she says. He was worried she’d say no. So he gives Haruka her dessert: a kiss. They relax for a bit. Otoya remarks this feels like a family: “Yeah, an existence even closer than lovers. You may be a cute little girl, but I feel like I’m wrapped in a large warmth.” He’s important to her, too. They embrace, and she closes her eyes. Haruka and Otoya are at the recording room. She’s been working on the song every day, and he’s been busy with work. She works on it some more. It’s done! She lets him hear it. 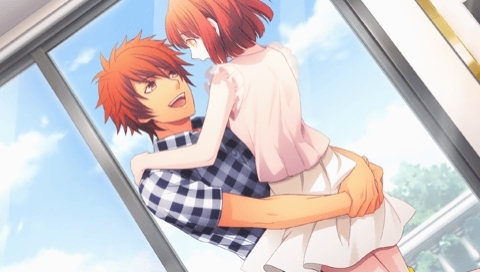 Otoya hugs her in happiness. He’ll sparkle, so look for to it. He’ll treasure it while singing. She’s looking forward to the lyrics. Haruka is reminded of their time as students. Otoya says he’s even more frantic than he was then. He’s in front of a lot more people now. He asks if what made the biggest impression on her. She replies when Otoya broke the “love is forbidden” rule. She thinks back on the Christmas party. He blushes and says he couldn’t help it because he liked her so much. It was so sudden that she was surprised. Even he didn’t know what was going to happen. He’s made her go through a lot during school and his debut. Otoya grabs her hand and says he receives strength from her. He’ll use his full ability and the hope she’s given him to catch his dream. Haruka believes in him. He tells her he’ll shine as himself with his song. They’ll work hard together. He smiles. In a meeting room, Otoya writing the lyrics with Haruka’s support. She doesn’t know what he’s writing. He wants her to wait until he sings it. She asks again cutely. He loses to her cute face and tells her to give him her ear. She leans in and he whispers he loves her. She’s surprised now, but she’ll be even more surprised by the concept. Haruka will wait. Hearing voices, Reiji comes in. He wants to know what’s going on. Otoya admits he’s a little worried about his lyrics. Reiji offers to take a look before his next job. He immediately detects the theme of the piece. Haruka thinks he’s heard about it, but Reiji corrects her; he got the concept solely from the composition. Reiji asks Otoya why he’s concerned about the lyrics. He doesn’t know if he’s expressing himself well. Otoya wants to write powerful lyrics about how he doesn’t want to lose or be outshone by anyone. He thinks people will be shocked. Reiji replies those are concerns, but Otoya should already know the answer. He knows Otoya can’t wait to sing the song and sing as himself. Reiji advises Otoya to sing honestly without worrying about what people think. Otoya is determined now. Reiji will always be willing to lend a hand but notes Otoya is growing up. Otoya thanks him but replies he has to stand on his own now. Reiji wonders if his role as onii-san/advisor is done, but Otoya is grateful. Reiji is looking forward to the finished project and leaves. Otoya finishes up the lyrics. The two leave the meeting room. Otoya now has to practice. Something suddenly flies by the two of them. An arrow? A note is attached: “Completion celebration”. Could this be…? They hear a loud laugh followed by, “HELLOOO, EVERYONEEEE!” Shining appears in his usual crazy fashion. Otoya’s still peeved about the arrow. Shining knows about the new song, much to Otoya’s surprise. He’s known since the beginning and knows they’ve been working very hard. Otoya thanks him. But Shining has a surprise: he’s prepared a big stage for the song to debut on. It’s the place from before where he wanted to do a solo live. Otoya is speechless. Shining is like, “Well, no reply, time to cancel.” Of course Otoya accepts. “It’s the best present! Thank you, ossan!” Shining exits. Now Otoya will really have to work hard. Haruka and Otoya walk home from the agency. It’s like a dream to him. He entered the entertainment world just because he liked to sing. He stops and looks at the setting sun. But Otoya entered Saotome Gakuen and debuted. He thought he might discover his father if he became famous. But now he wants to stand on the stage and express himself. He’ll be the only one and number one version of himself. Haruka thinks he can do it. He hugs her. She gazes at him lovingly and tells him she loves him. He blushes from happiness. They kiss. It’s getting late now. They return home. The day of the live arrives. She’s backstage with Otoya. He’s excited. They’re both looking forward to it. Tokiya arrives. Otoya tells him to get ready to see a new Otoya. Tokiya remarks Otoya is no longer looking at Tokiya but rather the future. He smiles. Otoya finally understood what Tokiya was trying to say. They each have their own abilities. Tokiya adds Otoya is like the sun. Otoya hopes they’ll stay rivals, but the other responds only if Otoya doesn’t give a halfhearted performance. Tokiya heads for his seat. It’s time for the live to begin. With a final squeeze of his hand, Otoya heads onstage. The crowd cheers. Otoya gets them pumped. He urges them to get louder. Haruka then is surprised to see Shining. “Show me, Otoya. Your new power.” His gaze is warm as he gently watches over Otoya. The opening song plays. Then he announces the next song: “Horizon“. Otoya finishes the song and his cool dance. The girls love seeing his cool side. He thanks the audience. One fan remarks it was adult-like. He wants them to continue supporting him. They will. His last song finished, the crowd goes wild. Otoya is grinning. He runs up to Haruka backstage. He’s thrilled by his performance and thanks her. He hugs her. She laughs and says he was very cool. Shining remarks Otoya is not worried about other people watching as usual. The couple quickly separates. Otoya is shocked but happy to see him. He thanks Shining for the location, but the other replies it was Otoya’s own power. He’s grown up. It’s thanks to Shining’s strictness. Otoya remembered a lot while working on the song. Shining says nothing as Otoya continues. He was thinking a lot about himself as an idol and his rivals versus himself. He should just live as he feels. Otoya can’t become stronger if he falls to pressure or lives as others expect. Shining asks if he’s obtained it yet. Otoya’s journey is still just beginning. He won’t have any regrets. He’s really glad he’s become an idol. He’s got his guitar, songs, and his most important person. Otoya wraps an arms around her shoulder. Plus he has everyone in the agency, including Shining. He’s happy and wants to shout it out. Shining is still listening intently. Otoya thanks him for watching over him and wants him to continue to do so. Shining gives a little smile. “Not a bad idea. No matter where you go, there’s no place these eyes can’t follow you.” Otoya says one day he’ll surpass “Ai Yue ni”. Shining and Haruka are taken aback. He adds Haruka can write a song that will make him the number one idol. Shining chuckles but is like, “You’re going to surpass me? That’s quite a brazen thing to say.” Otoya steals Shining’s quote of “dreams are big!” and says he’s going to become a legendary idol. Shining smirks but wants to see him do it. He gets serious. He’s looking forward to seeing where Otoya goes. Then he quickly walks away. Otoya responds he’ll catch up quickly. Haruka sighs in relief; she didn’t know how Shining would react when he saw the two of them. Otoya thought Shining looked happy. He suggests they leave and invites her over to his place. She agrees. They collapse on Otoya’s sofa. He’s still pumped from the live. She fell in love some more. His song, his dance, all of it was cool and wonderful. It was even more charming than his usual performance. Seeing his reaction, she adds he’s always wonderful, but this one made her heart pound and it was almost like meeting for the first time. He understands. It made her want to do her best as well and was overflowing with power. Then would she like to see him like that always? No, that’s not what she means. Like this? He gets close to her and asks in a deep voice, “Do you love me?” She’s flustered. “You this me is fine, right?” She’s blushing but admits it. “Tell me what you like about me.” She says he has a bright personality, his cheerful self is cute, but he’s also handsome. Otoya wants to hear more. She doesn’t say anything. He’s staring at her lips. Haruka loves all of him. In his more normal voice, he calls her cute and kisses her. He wants her to keep watching him. He kisses her a few more times and cradles her head. He loves her and will protect her. And he’ll grant Haruka’s dream. She loves Otoya, too. He says they don’t need any more words and kisses her some more. She closes her eyes as they make out. Otoya embraces her. He smiles. She always wants to walk with him to their future. Haruka can see his dream. He’s achieving it with his own power and charm. Otoya ends the show with some acrobatic stunts. She’s amazed. His dance is cool. The crowd continues to cheer as he smiles. He really did spread his wings. The fans love him. Haruka’s heart becomes warm. Shining is impressed. He’s grown up. Of course, she replies. This is the stage he’s always longed for, and he has important people watching. “Important…people,” Shining echoes. Haruka lists them: his mother, aunt, and probably his father. He thinks about this deeply. Otoya won’t forget how he wanted to become an idol and his gratitude in his heart for the one who watched over him. And he’s grateful to the president, too! Shining is surprised. Haruka says yes, Otoya wouldn’t have made it this far if it wasn’t for him. Otoya — and Haruka — can feel the love (ai) from all the trials Shining gave them. She thanks him. Thinking to herself, Haruka remembers how he always kept Otoya busy and was stern, but underneath it all, she felt the love. It felt closer to a father’s affections. He chuckles; “Ai yue ni (because of love), huh.” Shining smiles. They go back to watching Otoya. He wraps up the live with two encores. He thanks the audience and smiles. Backstage, Haruka congratulates him. He was cool. It was thanks to her song. Some of the staff compliment him. Otoya quietly asks if he can come over tonight. She’ll be waiting. With a wink, he leaves, making Haruka’s heart pound. At night, she really wants to see him. She can’t calm down. The doorbell chimes. She opens the door to see a tired Otoya saying he wanted to see her. He hugs her. Regaining his energy, he asks about the live. He apologizes for getting so excited. Haruka jokes he’s like a different person from earlier. Otoya blushes. He wanted to hug earlier, but the staff was there. As a idol, he wanted to be serious on the stage. She says it was properly conveyed through his performance. And she loved the lyrics. It’s showed a new side of himself. He’s glad the audience liked it, too. Haruka was entranced by his voice. And dance. And smile. He smiles brightly. She wonders if she said something strange, but he’s just so happy. This self was only born because of her song. He pulls her close again. Otoya explains how important and wonderful the song is. He’ll become stronger and shine more brightly than anyone. Haruka knows he’ll become the most wonderful idol. He asks if she fell in love again. Yes! Otoya loves her more than anyone. They start making out and she falls down on the floor. He won’t let her go tonight; he’s going to teach her more about his unknown self. He’ll show his boyfriend self to only her. They’ll slowly love each other and won’t worry about the time. Haruka enjoys this dream-like dream as they walk to the future. Haruka slowly opens her eyes. It’s morning now. She wakes up from the sofa in a shock. Haruka can’t believe they slept until morning. Otoya is still asleep. She likes watching him, but she’s worried about his work. She tries to wake him up. He realizes it’s morning and suddenly wakes up. Going back half-asleep, he mutters he has an off day. He apologizes for the intrusion but likes seeing her smile first thing in the morning. Haruka asks if his body’s okay, but Otoya replies he always sleeps swell next to her. He suggests they go out on the veranda. They go outside to enjoy the nice weather. He feels refreshed after talking to her last night. They talk about how they went back-and-forth like children over who loves who more. He worries his feelings aren’t properly being conveyed despite telling her he loves her all the time. She’s always thinking about him, too. They’re both so happy and glad to have met. Otoya kisses her hand and then wraps his pinky around hers. He loves her and seals the promise with a kiss on her finger. They’ll always stay together until they become old. Every day, he’ll say good morning and I love you, and he also wants to say good night. Plus he’ll sing her songs, full of love. Haruka will make more and more music for him. They’ll have problems and probably fight, but Otoya will never let her go. He’ll always face forward with a smile. She’s not afraid of anything if she’s with him. He loves her and will say it many more times. He’ll be her only one and wants to be her number one. Otoya swears the sun to fulfill his promise. She’ll follow him to the future he dreams of. He thanks her. They smile at the thought of their future.